Kino's Journey is episodic anime defined. With the exception of a single two-parter, all episodes begin and end mostly the same way; Kino and Hermes go to a town, meet people, stuff happens, and they leave at episode's end. That's pretty much it. But to quote Carlos' Azumanga Daioh review; "And yet, that's not it." One of the things that makes Kino's Journey work (besides excellent storytelling, immersive detail, great art design, and wonderful characters) is the contrast of Kino and Hermes' personalities. Kino is helpful, kind, and often listens to everyone when they talk. In contrast Hermes is whiny, skeptical, and often makes sarcastic comments. Both are interesting, likable characters in their own rights, and it's one of the reasons Kino's Journey works as good as it does. Hermes isn't just a talking motor rad, nor is he a psuedo-mascot; he's kind of like a second conscience for Kino, the one that goes "I'd think about that before going through". In the previous paragraph I said that Kino is often kind to others, though this isn't always the case. There are even a few times Kino just stands there idly and watches as people's lives literally crumble as a result of Kino's actions. Even Kino seems to realize this by series' end, and feels a little bad by it. (Or maybe not?) Again, this kind of character depth makes Kino much more fleshed out as a person than the typical anime girl. Only by watching the whole series will you learn more about the title character, making every episode feel important despite Kino's Journey being an episodic anime. Every town Kino visits has its own story to it, too. One town has the townspeople make up their own traditions to attract guests, another a town of telepathic people who live apart from each other since they can read each other's thoughts, and then another a town where tanks and such are defunct, even used as playthings for little kids. It adds a lot to the series and, much like Kino's complex personality, it makes the series seem than a mere animated series. One of my favorite episodes has technically two main plots. Kino and Hermes met an old railroad worker, who's been shining the tracks on a railroad for 50 years. On another side Kino finds a railroad worker who's been taking off the tracks, also for 50 years, and then someone putting on more tracks, too! The second plot of the episode, and the main one, has Kino and Hermes go to a town where the people work not because they have to, but because they have literally nothing else to do with their free time. In this town robots do everything for people, making the townspeople actually restless enough to want to work, even if tis' ultimately pointless, just to pass the time. Kino's Journey tackles a lot of topics (sometimes several in a single episode) in its run. Topics of interest include: festivals, traditions, activities, freedom, individuality, war, machines, and even life itself. And almost all of these are handled with a philosophical approach that rarely ends on a happy note for Kino and Hermes, or anyone else involved with them. Of the 13 episodes in the series, the only episodes I didn't particularly care for were episodes 6 and 7. I'm probably alone on this one, but I think that having a series like Kino's Journey - a series that has several stories in one episode - and then suddenly having a two-parter halfway through is a bit much. It's basically a two episode long fighting tournament of sorts. While it does have its moments (much like the other 11 episodes), they were far and beyond the episodes that held my attention the least. I'm probably not looking deeper into these episodes, but I didn't care much for them at all. The animation is pretty solid in Kino's Journey, with Kino having a basic but appealing character design. Most of the characters of the episode look pulled out of a kid's show though, which can be a wee bit distracting at times. The background music is nice, though it's not particularly memorable. (The opening and ending themes are quite solid, though.) I'm also really not that big a fan of Ryuji Aigase's voice as Hermes (his only other anime role being Colonel MacDougall in Spriggan), but it's suited to his character. Ai Maeda is quite good as Kino, though, and it's a shame she hasn't been in anything non-Kino related after all these years. Overall Kino's Journey is a very nice show, but it's not a series the casual anime fan will probably like. Not because it's bad or anything, but because it's a bit slow at times, and there's no real plot. 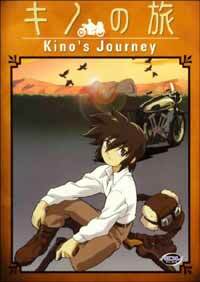 Personally, I quite like slice-of-life anime, and Kino's Journey is one of the very best of its kind I've ever seen. Enough to give it a (rare) very high recommendation, even.